Tablets are getting cheaper all the time and the MEDION LIFETAB S10346 available from Aldi promises not to buck the trend. The tablet, available for £149.99 sports a 10.1-inch display and comes with Android 4.4 is equipped with a quad core Intel Atom processor running at 1.83GHz as well as 32GB internal memory, long battery life, front and rear facing cameras, a GPS sensor and stereo speakers. The display which features full HD resolution (1,920×1,200 pixels), IPS technology. There is also a tablet stand for comfortable viewing and stereo speakers. There is also an anti-fingerprint coating. The tablet is thin at 8.5mm and weighs just 580g but manages to pack in a 5MP autofocus camera on the rear and a 2MP front camera with microphone. A GPS sensor provides quick positioning. It also sports an infrared function to turn it into a handy universal remote control for operating existing devices such as a television or DVD player. In addition, there is a micro USB host function for direct transfer of data as well as connecting with input devices such as keyboards or a mouse. It also features wireless LAN IEEE 802.11 b/g/n. It offers numerous connection options – miniHDMI out, microUSB 2.0 with USB host function, micro SD/micro SDHC/micro SDXC memory card reader and Bluetooth 4.0 function. The tablet comes with a tablet stand, in-ear headphones, microUSB cable, microUSB host cable, mains adapter, warranty card, quick guide, overview of the device, safety handbook. 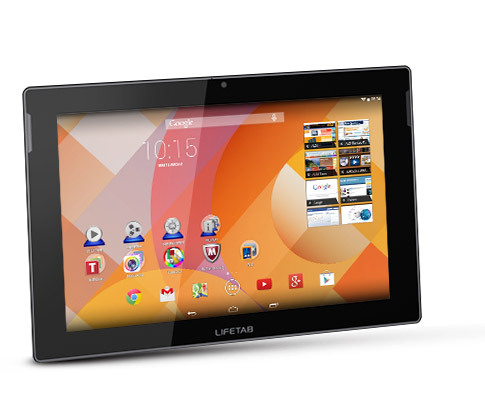 It use it was responsive to touch and the graphics were on par for a tablet this price. The sound was OK though the built-in speakers as well. Overall, this is a cracking tablet for the price and available from Aldi in stores today (11th December), available while stocks last.